If you’ve always coveted the classic Martin dreadnought tone, but couldn’t afford a genuine Martin, the DX1AE is the instrument you’ve been waiting for. A sad fact of the modern acoustic guitarist’s life is that the supply of traditional tone woods is vanishing at a more rapid rate than sources can be replenished. While many impressive guitars made of alternative materials have appeared on the market over the years, the truly great ones often cost more than a comparable guitar made from traditional tone woods, so most players never really give them the chance they deserve. Martin was one of the first major manufacturers to offer low-cost instruments made from high-pressure laminates (HPL), and in their ongoing quest for excellence they have refined their designs to the point where they now deliver the signature Martin tones that so many players covet. The DX1AE Macassar Burst is a stellar example of just how far Martin’s efforts with guitars built from alternative materials have come, both sonically and aesthetically. FEATURES The DX1AE is a traditional dreadnought in the iconic acoustic guitar shape that Martin invented and perfected; and it is also equipped with built-in Fishman Sonitone electronics, so it sounds as good amplified as it does when played acoustically. Whereas most of the guitar is made of alternative materials — including its high-pressure laminate back and sides, birch laminate neck, and Richlite fingerboard and bridge — the top and braces are Sitka spruce. Fortunately, spruce isn’t a threatened tone wood species so, from an economic and environmental perspective, spruce still remains hard to beat when it comes to delivering classic, crisp dreadnought tone. In conformance with beloved Martin dreadnought specs, the neck has a 25.4-inch scale, 16-inch radius, 20 frets, and a 1.75-inch nut width. The neck is shaped in Martin’s Performing Artist profile, which has a slim, rounded feel that will appeal to electric guitarists making the transition to their first acoustic. Other features include enclosed chrome tuners, a Corian nut and Tusq saddle. PERFORMANCE While most acoustic guitars made from alternative materials look cheap and fake from a mile away, Martin has done a commendable job in building an instrument that looks as beautiful as acoustic guitars made from traditional materials. Our example has the optional Macassar Burst finish, which boasts a rich warm glow, but what is really impressive is how the HPL back and sides have realistic grain patterns that would fool even the most conservative acoustic guitarist. The overall aesthetics may be simple, but the DX1AE looks as beautiful as many of Martin’s more expensive instruments. Visual beauty is one thing, but fortunately the DX1AE’s tone is as gorgeous as its looks. 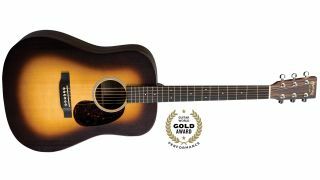 It delivers classic Martin dreadnought “boom” with deep, commanding bass. The midrange is sweet, and the treble has a brilliant zing that really cuts through when strumming chords. Due to its non-scalloped X-bracing, the tone is not quite as complex, responsive and delicate as a more expensive Martin dreadnoughts, but the core and character of that unmistakable, beloved Martin dreadnought is still present in spades. The playability is outstanding as well, with a relatively low action that remains buzz free even when players vigorously strum chords. Acoustic purists will love how the Fishman Sonitone system is almost invisible, with only a small block on the side of the lower treble bout for the ¼-inch output jack and battery access port. Volume and tone controls are mounted inside the soundhole above the low E string where they’re easy to reach when needed but otherwise stay out of sight and out of the way. The system faithfully captures the pure acoustic essence of the DX1AE tone with an alluring warmth and no harsh transients or overtones. • The HPL back and sides boast realistic-looking grain patterns that will impress even the most eagle-eyed acoustic guitar purist. • The neck features Martin’s Performing Artist profile, which has a slim, rounded feel that electric players making the transition to acoustic will find extremely comfortable. • THE BOTTOM LINE If you’ve always coveted the classic Martin dreadnought tone, but couldn’t afford a genuine Martin, the DX1AE is the instrument you’ve been waiting for.